Casual dining is a highly desired category for growth. The challenges with store expansion are steep for national casual dining brands. Same store sales have been declining and pressure from investors has limited new store expansion. Real estate decisions are driven by “home run” locations where store sales can be maximized for profit. Good news is, Americans eat out far more today than in years past. The restaurant category, is the most aggressively growing categories in real estate. 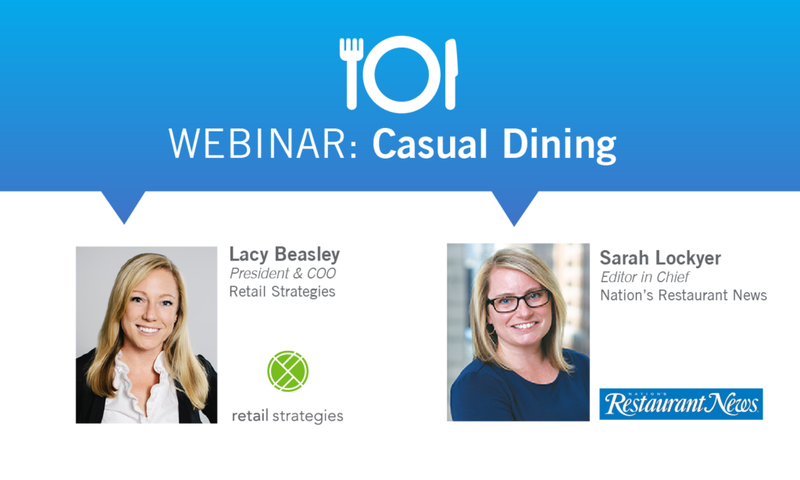 Hear how the casual dining concepts plan to compete with fast casual and quick service restaurants from Sarah Lockyer, Executive Director of Content & Editor in Chief for Nation’s Restaurant News. Please join us on Tuesday, July 26th from 10AM to 11AM (CST) with your host, President & COO of Retail Strategies, Lacy Beasley.